This course builds on the skills and experience that you learned on your basic training courses and develops the skills and attitudes required for you to regularly and confidently plan and lead dives with other divers of a similar or more junior level. If you are having difficulty organising, or completing your BSAC Dive Leader Training within a BSAC branch, then you have the option to complete all or part of it with our training school. We will complete the required training within the warm, sub-tropical waters of the marine reserve here on Gran Canaria and ensure that you meet the standards set by BSAC for this course. Minimum Requirements Must hold a second level qualification, such as BSAC Sports diver, or equivalent. Must pass BSAC Medical, and be over 14 years of age. You should have a BSAC Qualification Record Book. Divers who are contemplating this level of course should have the majority of their own equipment. Course Content Seven lessons in the sea in the marine reserve, twelve theory lectures including oxygen administration, some reading, dive planning and marshaling practice and a final exam. If you are already taking a Dive Leader course with a UK BSAC branch you can complete just those sessions that you require with us. You will learn about planning and managing diving, additional first aid for diving related injuries, as well as advanced diving skills and techniques for leading divers underwater. In addition this course includes the BSAC Oxygen Administration Course which teaches you how to administer oxygen to diving related casualties. Duration and Logistics Usually 6-7 days, . All transfers included. Timetabled to suit any other holiday or partner commitments. Languages English - Instruction, Books and papers. What you get When you have completed the course and your five experience dives you can present your BSAC Qualification Record Book to your DO (or BSAC HQ) who will then award the BSAC Dive Leader certification. This qualifies you to dive to 45m(following assessed depth progression) when accompanied by a diver with similar or a higher level of qualification. You can also then take less experienced divers to dives within their maximum depth qualification. If you are not a current member of BSAC, or if you have qualifications from another agency such as PADI you can still do the course, and you will then get a free 3-month membership of BSAC direct. 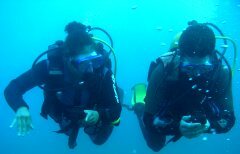 Join a BSAC branch and plan and lead some more adventure dives. Explore new areas as part of branch diving activities. Take the BSAC Advanced Diver course and broaden your knowledge, increase your confidence, and take part in some really great adventure dives, or take a Nitrox course, boat handling, or any of BSAC's other skill development courses. You can also start or continue BSAC instructor training. Price Price will vary with the number of elements taken, and you can do anything from 1 element up to the whole course. To take all the modules, in the Marine Reserve the price is €525.00 but this excludes personal equipment hire and any supplements for boat diving. What is included All transfers to and from your hotel, use of special equipment for all dives(reels, SMB, compass etc), free tea, coffee in the dive centre, all tuition, tests and QRB completion. 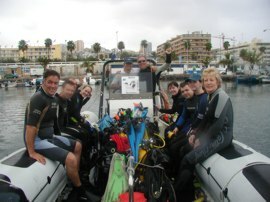 If possible you complete your reading of the BSAC course notes before you come to Gran Canaria. The BSAC course notes are available from your branch training officer, or through us. If possible attend the theory lectures before you arrive here in Gran Canaria. All students on all courses should have a log-book in which to record their dives. We have several different logbooks from €8 to €25. Referrals If you have completed part of the course already, (eg pool training in the UK) we can accept the referral providing you present us with the signed BSAC Qualification Record Book (QRB). Pricing will depend upon content already completed.